Andy Kahn adds "AUTHOR" to his list of artistic accomplisments. With the recent release of his first book "The HOT SHOT Heard 'Round The World - A Musical Memoir" - Andy brings into focus the extraordinary happenings of a lifetime influenced by music and the arts. This new book is published by BearManor Media and is available for sale in Paperback and Hardback versions on amazon.com, also directly from the publisher at bearmanormedia.com and from fine booksellers everywhere on Planet Earth. ANDY KAHN, producer/composer of the #1 dance hit, “Hot Shot” is a jazz pianist, record producer and arranger, educator, vocalist, composer, businessman, music historian and archivist. He divides his time between residences in Philadelphia and Atlantic City. The Hot Shot Heard ’Round The World is the singular story of an extraordinary life deeply entrenched in the entertainment industry, hit recordings, disco nights and delights, hot jazz, and the humbling experiences of achieving fortune and fame coupled with losses and gains. "I am loving your book “The HOT SHOT Heard ‘Round The World” It is superbly written, so interesting and informative. I love the way you take complex concepts, which you understand so deeply, and explain them clearly for the average person. And I love the stories about your insatiable curiosity and entrepreneurship. In addition to enjoying the story tremendously, I am learning a lot. Bravo!" 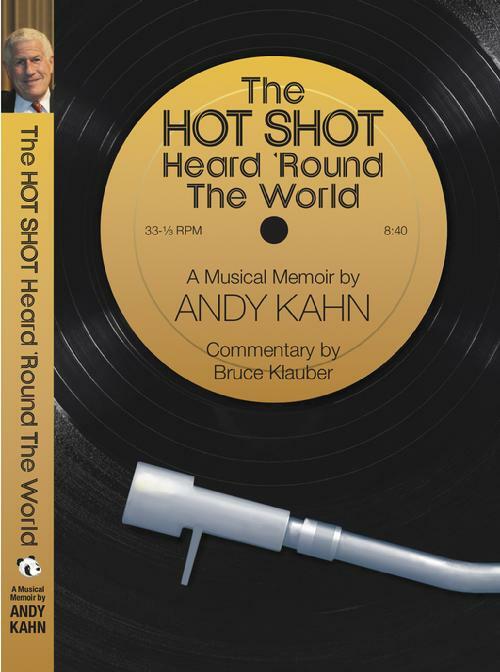 In his entertaining and touching memoir "The HOT SHOT Heard ‘Round the World," Andy Kahn relates the incisive and often back-stabbing stories involving his 1978 disco hit record “Hot Shot,” the astounding rise and fall of the disco movement and the incredible evolution of the recording industry from analog to digital. He presents a wholly unique life that includes acting on stage at age nine, befriending actor Robert Preston, helming a pirate radio station at age eleven, the meteoric rise in his career as a jazz pianist, bandleader, musical archivist, jazz educator, arranger, producer for major record labels and as the co-owner of an influential recording studio in Philadelphia where artists like Stevie Wonder, Princess Grace of Monaco, The Gipsy Kings, Astrud Gilberto, Mayor Frank Rizzo, Bobby Rydell and The Dixie Hummingbirds came through its doors. Andy Kahn tells a deeply personal life story—one that’s hardly over. In 1973, I helped Andy Kahn facilitate the formal beginning of his musical group The All-Star Jazz Trio at my Philadelphia restaurant and musical bar. I was certain he was headed for an extraordinary and successful career in many facets of the entertainment business. Regarding his newest role as an author, I’m pleased to say I was right. Andy Kahn achieved legendary status in his craft with the immortal Disco classics “Hot Shot” by Karen Young in 1978 and “Stand Up Sit Down” by AKB in 1979—more than 40 years ago! Having contributed my own remix of the #1 dance hit "Hot Shot" in 2008, I love and appreciate Andy’s musical legacy. He’s been a mentor, a good friend, and he holds a place in dance floor history. Andy will always remain a part of my own molding as a producer, arranger and remixer. I heard Andy Kahn play the piano for the first time in 2013. I was so impressed that I told him right then that he was the best pianist I ever heard and that “We must do something together sometime.” Well, we did something together, we still do, and I still think he’s the best pianist I ever heard. And everyone knows that I love him, too! I’ve known Andy Kahn since he was 10. I’ve watched him succeed in a variety of musical pursuits as a performer, songwriter, record producer and music educator. His new book “The Hot Shot Heard Round The World“ chronicles his experiences in the music business from a number of perspectives. A real life-learning curve. Andy Kahn’s piano playing has long been a fixture on the popular music scene in Philadelphia. His professional roots in Swing and Jazz go back to his teenage years. Andy’s broad knowledge and infectious enthusiasm for The Great American Songbook have made him a welcome guest during radio programs I host on WRTI in Philadelphia. As a performer, he contributes a great deal to keeping American Standard Songs alive! Since meeting Andy Kahn in 1998, I've enjoyed the twin pleasures of his great friendship and being a part of his audience for musical performances in a variety of venues and platforms. I've watched him perform at nightclubs, concerts, special events, academic institutions, private parties and audio recording sessions for CDs, radio and films. In fact, I consulted closely with Andy on the music for a documentary film I finished in 2017. And for two decades, Andy has also entertained me and others with his wonderful stories, many of which are collected here in his page-turner of a biography that's as engaging, energetic and fun as being in the same room with him.